We arrived in Puerto Limon or Limón on the Coral Princess in November for our Limon Shore Excursion. The November weather was sunny, hot and humid with early morning heavy clouds. Only about 70,000 live in Limón. It’s a poor town on the Atlantic Coast of Costa Rica. Most people earn a living working for Dole and Delmonte, who export large volumes of bananas and pineapple. Organized land based Costa Rica tours usually don’t include Limón. 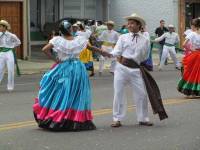 Those tours head north from San Jose to Monteverde and then visit places on the Pacific Coast. Most tourists visit mainly from cruise ships that stop as part of Panama Canal voyages. The first stop on our Limon Shore Excursion was a banana plantation visit. As the tour bus left the harbor, we drove through the open market area beside the port. The level of poverty was a bit shocking. After a short drive we arrived at the banana plantation. Our guide provided a tour of the harvest and processing of bananas right through to the final preparation for shipping. The main point I remember is that our guide explained that green bananas taste the best, but Americans don’t like to buy green bananas. 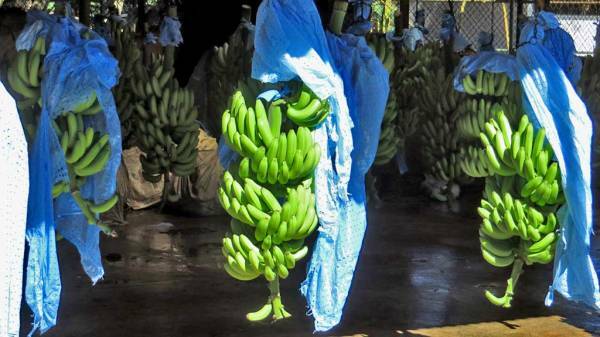 Workers harvest the bananas so that the bananas will turn yellow just as they arrive on the shelves in the United States. Our guide thought it was very sad that most people don’t get to eat green bananas. The second part of our Limon Shore Excursion was a train ride. The train ride itself wasn’t very impressive. The train cars were small and old. The route for the train ride skirted industrial areas of Limón. 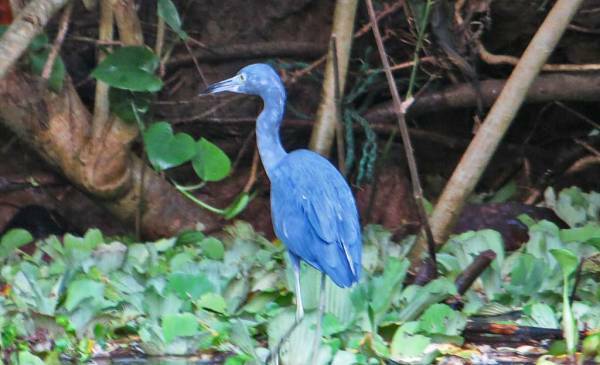 We received a pleasant surprise though when we reached an area of thick rainforest. Howler monkeys were making loud noises in the tree branches above the train. The engineer stopped the train ride and shut down the engine while we listened to the howler monkeys. You could also step out between the train cars to get a good view of the excitement above. 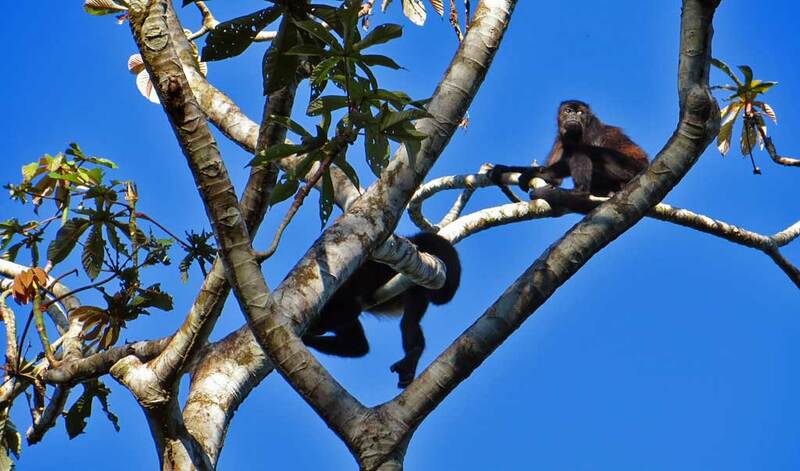 The howler monkeys totally changed our opinion of the train ride. The third part of our Limon Shore Excursion was a boat ride in the Tortuguero Canals. Limón is on the flood plain / delta created from the rivers generated by the mountains to the west. 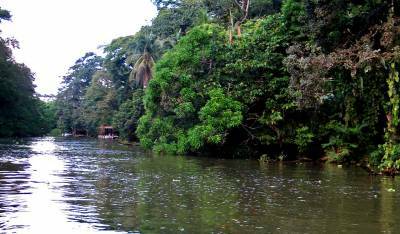 The Tortuguero Canals are a series of man-made and natural waterways that extend many miles up the coast between Limón and Tortuguero National Park. 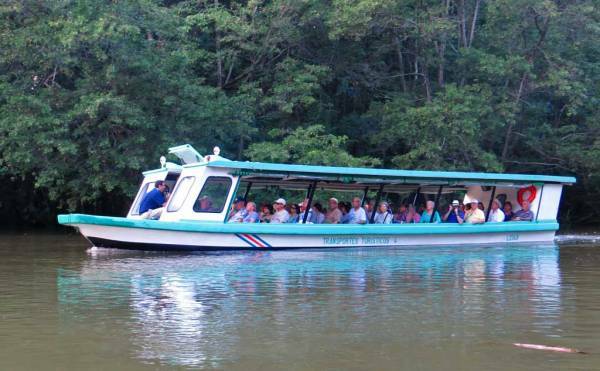 The southern portion of the canals terminates at few miles north of Limón, so that’s where our Limo Shore Excursion headed. You have the chance to see sloths, crocodiles, river turtles, iguanas, green basilisk lizards, monkeys (howler, spider and white-faced capuchin), bats and many varieties of birds. On the short bus ride to the Tortuguero Canals, we saw signs along the coast line of the 1991 earthquake. Reefs were permanently raised slightly above sea level, which made the bay look like rumble from an ancient ruin. On our boat cruise through the Tortuguero Canals, we were fortunate enough to see a sloth high up in the rainforest canopy. I was surprised by all the birds, which you can get quite close to. The blue heron was a beautiful dark blue, which was far more colorful than the grey blue of herons in North America. 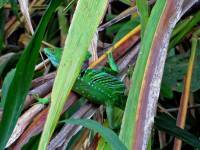 My favorite sighting was a Jesus Christ Lizard or green basilisk lizard, hiding behind a palm branch. 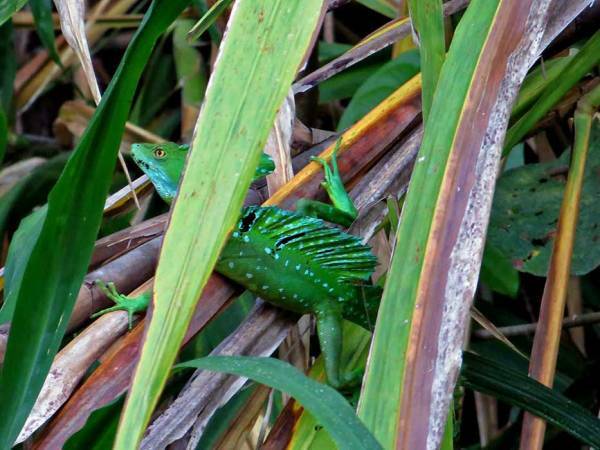 Jesus Christ Lizard’s get their name because their light flat bodies allow them to scurry quickly over the surface of water. They “walk on water” just like Jesus Christ. 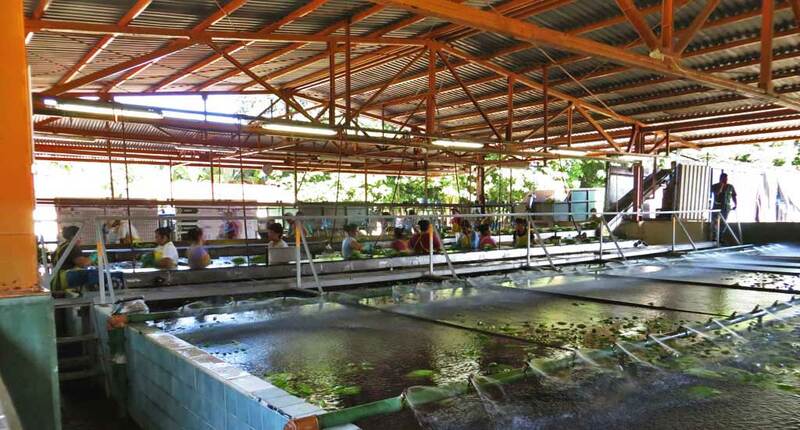 For those who have more time than just a shore excursion, there are lots of other things to do in Limón. You can find turtles or tortugueros along the Caribbean coast. The egg laying season is from April to May for leatherback turtles and July to October for green turtles. Visit a sloth sanctuary near town. Travel north to Tortuguero Village at the mouth of the Tortuguero River in Tortuguero National Park. Or go rafting on the Reventazon River. If you arrive in Limón in October you can watch the Carnaval del Caribe, which is an annual one week celebration of the arrival of Christopher Columbus.